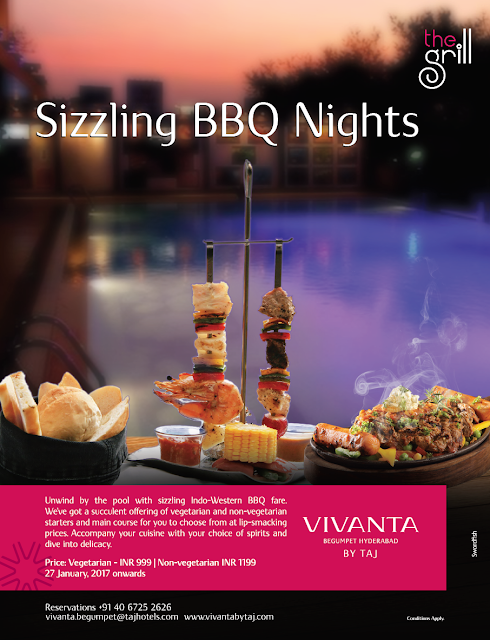 Taj Vivanta is located very close to my house in Begumpet and it is often my choice to get a quick meal. Whereas Viva and Thai Pavilion have been visited many times, I have never set foot at The Grill, their poolside restaurant. So, when I received the invite for an evening of grilled food here I was quite interested. The swimming pool is located on the second floor, behind the gym and the spa. I do not know if I took the correct route to it, as I had to ask a couple of times, but the place seemed a little hidden to me. However once I reached there I liked what I saw, tables nicely laid out next to the swimming pool and also some more in the covered area housing the bar. Here I met Executive Chef Jaffer Ali, who has taken over at Taj Vivanta couple of months ago. Within a few minutes of striking a conversation, I was impressed by his knowledge of different cuisines. 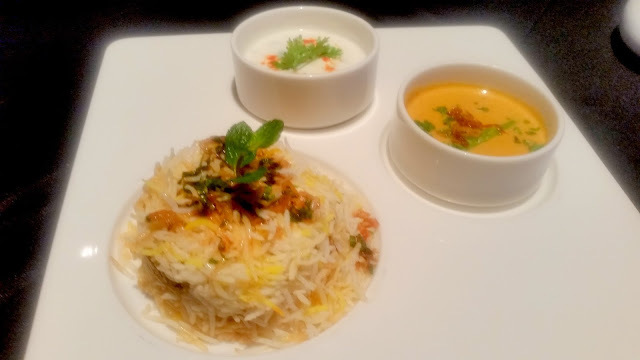 Chef Ali has a treasure trove of experience in different properties including Taj Connemara in Chennai and the Taj property at Maldives. 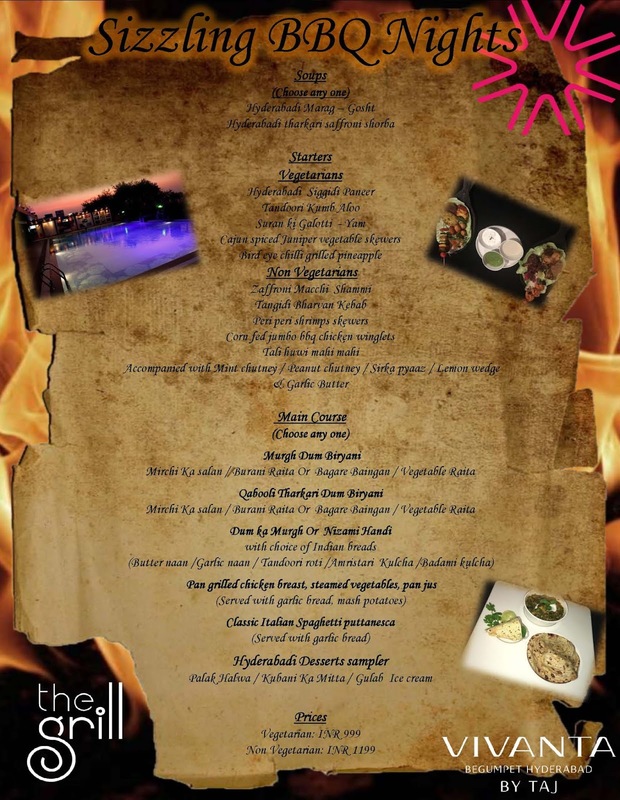 The Grill has introduced a set menu for the evening to be enjoyed with your favourite drinks under the open sky. The highlight of the menu is the starter platter, where unlimited quantities of five starters (vegetarian or non-vegetarian) are served. With this comes a choice of soup, main course and dessert (one each). 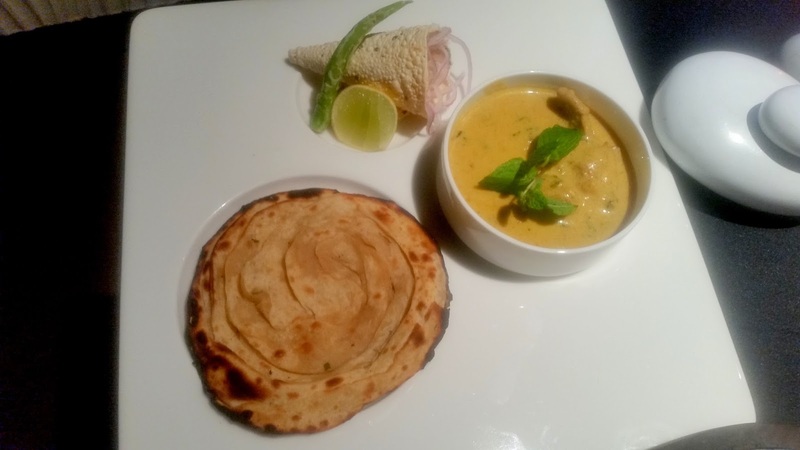 The vegetarian set menu is priced attractively at Rs 999 and the non-vegetarian Rs 1199. 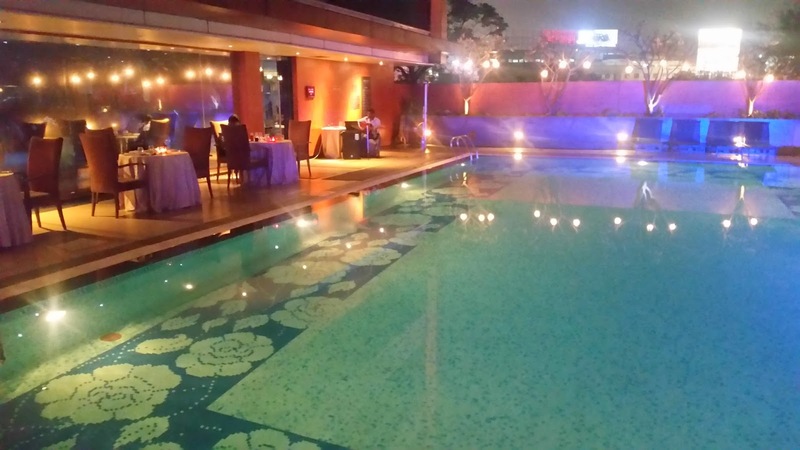 We were comfortably seated near the pool (though since I was seated closer to the pool, I always had a nagging worry that I will topple over into the water; actually the water was quite a distance away). Chef Ali who was sitting next to me gave me a detailed insight on the non-vegetarian cuisine from different regions of Tamil Nadu. I would look forward to a festival on those lines from him. They have a menu which changes every day – the menu for that particular day is below. We started with Hyderabadi Gosht Marag, a yoghurt based lamb broth which is one of the signature dishes from Hyderabadi cuisine. The texture of the broth was perfect, it had the desired aroma of a good lamb soup, and the taste did not disappoint too. The starters were presented very attractively. 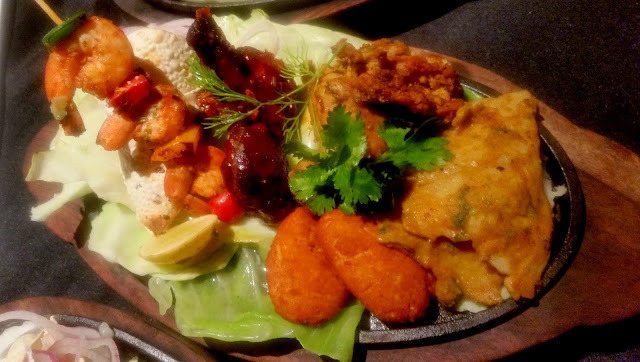 As is obvious, I went for the non-veg platter, though the chef also plated the veg one along with some more variations for us to have a look after the dinner. 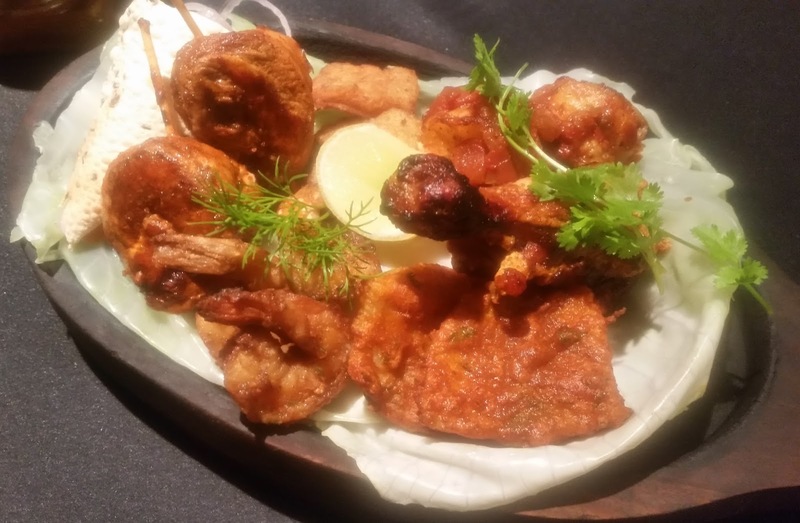 The Bharwan Tangri Kabab, chicken legs stuffed with spiced up chicken mince was extraordinary. The Peri Peri Shrimps on the skewers also were grilled just the right amount, I admired the quality of seafood, though I would have liked the spiciness here to be enhanced. The fish in green marinade, Tala Hui Machhi, however, was a dish where the combination of spices was just perfect, and the fish had retained its juiciness. Chicken Winglets were par for the course with a slight overdose of bbq sauce. The Zaffrani Macchi Shammi Kabab was a miss for me, it was a tad too dry and the taste of fish did not come through. Some of the items in the vegetarian starters list looked very interesting, so we asked to try out some of them. Suran Ki Galauti. The yam based Awadhi kabab was just melt in the mouth as it should be and I loved its taste. The previous week I had tried galautis in three different places in Hyderabad, and this was definitely one of the better ones. We also tried the Birds Eye Chilli Pineapple which was quite well prepared, though as per me the expected fieriness was missing. You might find me regularly whining about the lack of spiciness in many of my posts, I think a couple of decades in Hyderabad has really altered my taste buds. My choice of the main course was Dum Ka Murgh. With soft garlic bread, the gravy was a complete show-stealer. The chicken cooked in its own juices had soaked in some masala as well, and I was completely bowled over by the preparation. One of my friends tried out Classic Italian Spaghetti Puttanesca and she seemed to love it. I also tried some biryani from another diner. The other options for the main course were Nizami Handi as well as Pan Grilled Chicken Breast. To end the meal, we were presented a Dessert Sampler with three different dishes. 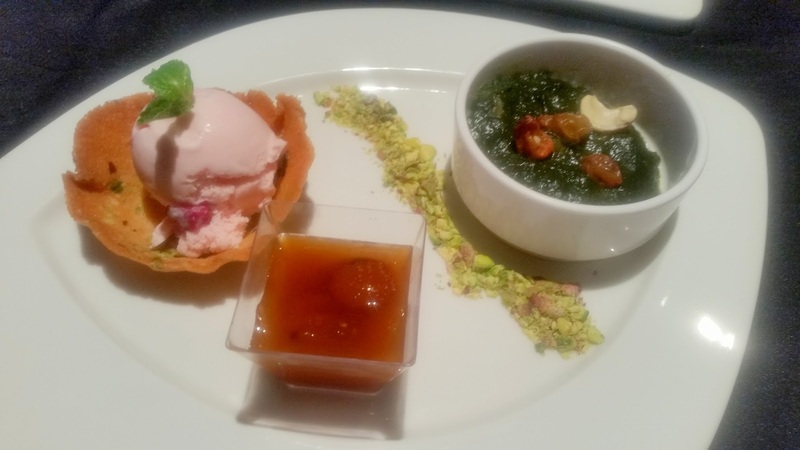 The Palak Halwa was innovative, but I could not quite appreciate the taste of palak in a sweet dish. The local Qubani Ka Meetha and especially the Gulab Ice Cream were quite good. 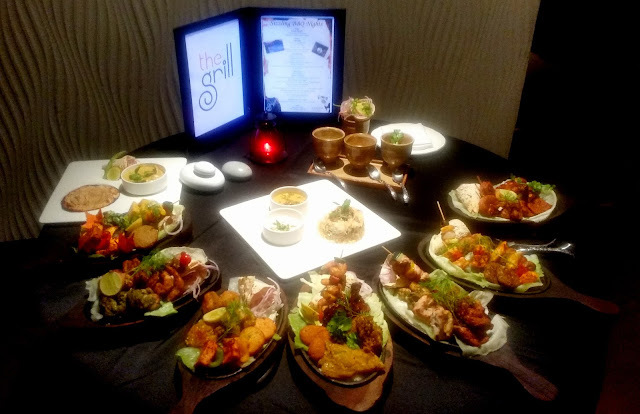 As mentioned earlier, at the end of the meal, the Chef had arranged for a display of quite a few different platters which were part of the rotating menu. Some of these combos really looked interesting. Each had some exquisite seafood dishes as well as some meat ones. 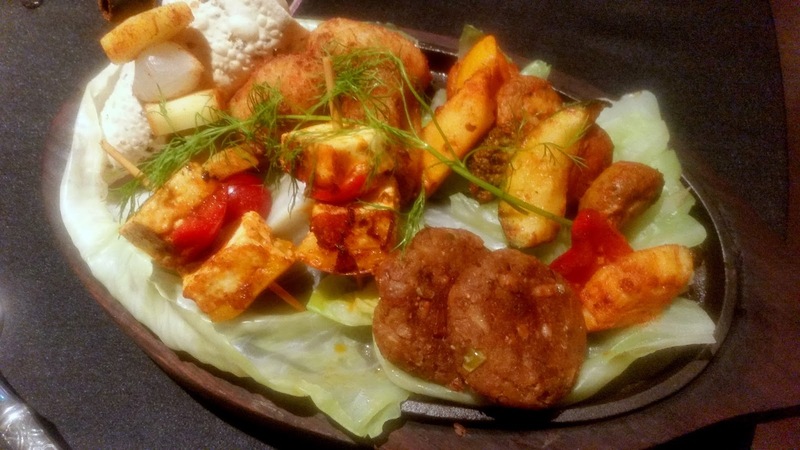 For vegetarians, apart from paneer and mushroom, there was a range of vegetables. The food was good and so was the ambience. A nice place to visit in the evening before the onset of summer.